From the seaside promenade, or paseo marítimo, the beach opens out in a perfect half-moon curve to embrace the blue Atlantic. Scattered sail boats, moored about 100 feet out from shore, bob gently in the current. West of the beach, rolling green hills tumble to the sea; to the east lies verdant Monte Urgull, ringed by the stone sea wall and artfully weather-beaten buildings. In the center of the bay lies the green island of Santa Clara. This stylish, seaside city on Spain’s north Atlantic coast—only about 10 minutes by car from the French border—is legendary for its charm. 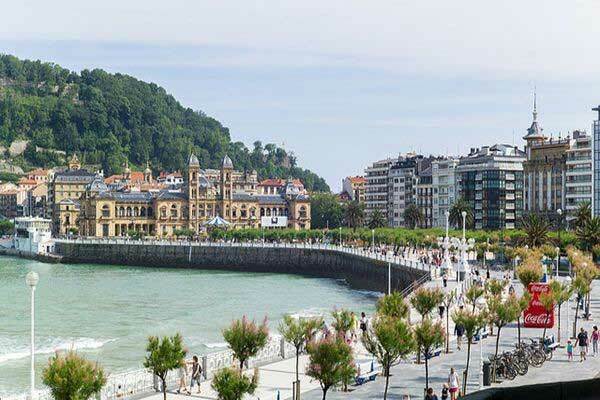 A famed resort since the mid-1800s, when Spanish royalty and nobility chose it for their summer stays, San Sebastián (known as Donostia in Basque) boasts what is arguably one of the world’s most beautiful urban beachfronts. Here curving, golden-sand beaches like Playa de la Concha, with its long promenade, offer a feast for the eyes. Equally beautiful is the city itself, with its wide boulevards and frothy Belle Époque buildings, light and airy as meringue. In fact, with all that this sophisticated city offers, the beaches are simply the icing on the cake…. 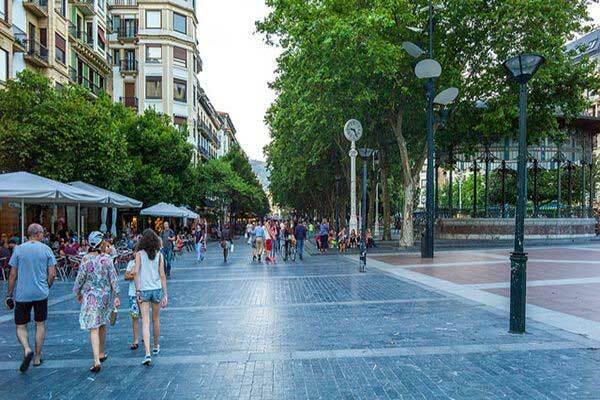 Walking from the city center toward the seashore, for instance, you can stroll down the 19th-century Centro Romántico’s broad boulevards, where creamy turn-of-the-century buildings house high-end designer boutiques. Here you can shop ‘til you drop…and even if you don’t intend to spend a penny, San Sebastián makes you want to look. Gaze at $2,000 jackets in the windows of luxury retailer Loewe and at absurdly fashionable shoes at Ayestarán…check out trendy but lower-priced duds at Mango and Zara…stroll by the cathedral, the theater, the market…and finish off the morning with a café con leche in a sidewalk café alongside chic Spanish matrons in summer skirts and heels. You’ll definitely want to walk the elegant Paseo de la Concha, the boardwalk fronting the water, to gaze at the beach. 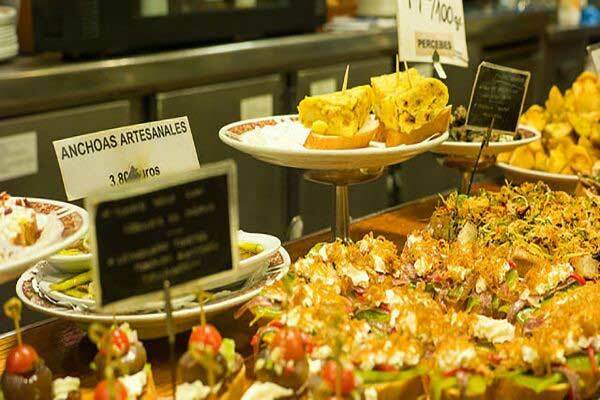 But as mealtime approaches, you’ll also want to indulge in San Sebastián’s second claim to fame…its food. This city is the high temple of Basque cooking, widely considered one of Spain’s best regional cuisines. Half of Spain’s three-star Michelin restaurants are in San Sebastián—or, to look at it another way, San Sebastián has more three-star Michelin restaurants per capita than any other city in the world. But if you’re short on time (or money) you can skip iconic restaurants like Akelarre and Arzak. Even the lowest bar here serves scrumptious chow. For a quick, inexpensive route to gustatory nirvana, try bar-hopping through San Sebastián’s old city, known as the parte vieja. Just steps from the beach, the parte vieja’s narrow cobblestone streets are perfect for wandering. And its tall stone buildings are home to a staggering number of bars serving pintxos (pronounced PINCH-ohs). That’s what tapas—often served atop a slice of bread—are called in the Basque country, the 100-mile stretch of northern Spain to which San Sebastián belongs. Bite-sized morsels meant to accompany drinks, tapas are one of Spain’s most famous culinary exports. And in the Basque country they’ve been raised to an art form. By noon, bar counters groan under the weight of up to a dozen trays of pintxos, laid out for hungry customers. These include toothsome offerings like béchamel-topped crab on tiny rounds of toast; skewers of anchovy-filled olives and onions; and field mushrooms sautéed in garlic and olive oil, among other delights. To wash them down, what else but the Basque country’s astringent, slightly fizzy white wine, txakolí? A half-glass of txakolí and a couple of pintxos can run $6 to $7. For about $20 you can have a filling lunch…and never repeat a single dish. The population of about 186,000 can almost double in the peak tourist months of July to September, when the cost of short-term apartment rentals near the beach soars to nose-bleed levels. But crowds are thinner the rest of the year…and short-term rental prices drop a bit, as well. In off season, you’ll pay about $2,500 a month and up for a centrally located, two-bedroom apartment. If you prefer to buy, be prepared for a steep price tag. This city has long been a coveted resort, and it shows in the prices. Most properties listed for under about $350,000 are tiny. But for glamour, sophistication, and sheer beauty, San Sebastián is hard to beat. This is one classy lady, indeed. Beyond strolling Playa de la Concha and tapas bar-hopping in the old city, what else might you want to do in San Sebastián? Here are a few suggestions. Plaza de la Constitución is a pleasant square to wander around. The many sidewalk cafés, or terrazas, here are great locations for people-watching. So pull up a chair, order a cold drink, and relax and enjoy the ambience. Monte Urgull offers one of the best views of the city. Take the cable-car from the lovely, urban Ondurreta beach. It’s a bit of a climb to see the views…but it helps work off those extra tapas-based calories. Mercado de La Bretxa is one of San Sebastián’s traditional markets. It’s a superb place to see (and buy) high-quality foods of all types, from locally sourced vegetables to recently caught fish and seafood. A market that’s good enough for San Sebastián’s top chefs is definitely worth a visit.